Haitian Paintings by Louverture Poisson. Louverture Poisson was born in Les Cayes on September 14, 1914. He came to Port-au-Prince in 1942 to enlist in the Air Force where he was an airplane mechanic. He joined the Centre d’Art in 1945, and had a one man show there in March, 1955. n the beginning, he painted with what DeWitt Peters described as the world’s most recalcitrant medium, common house enamel. One of his early paintings, "Toilette Paysanne", depicting a bare breasted woman fixing her hair in front of a mirror, is said to have inspired many primitive artists to try their hand at painting, because it was such a common scene. He died in 1984. 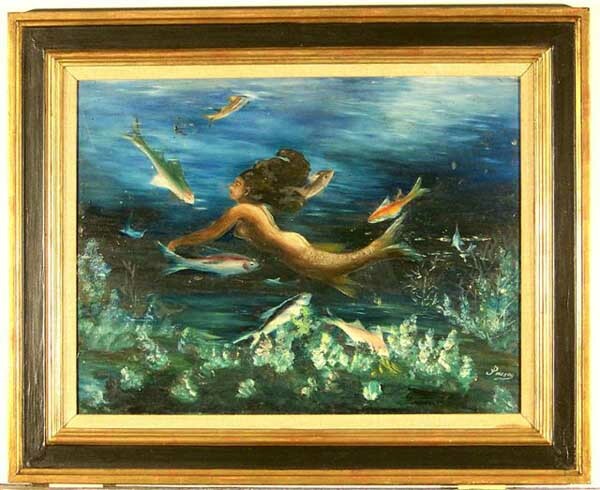 * This painting, beside being an unusual example of Poisson's work, has a special provenance; It was acquired from Selden Rodman in the mid 1950's by the American artist, James Kearns. Other works from Mr. Kearns collection, by Robert St. Brice, George Liautaud, Castera Bazile and Janvier Louisjuste, are also available.